There are currently 31 standard level-2 eCharge Network stations available for use in New Brunswick. Electric vehicle charging stations are being added to six provincial parks in New Brunswick, a province that sees 95 per cent of its tourists visit by road. New Brunswick will add a combined 12 standard Level 2 charging stations at the parks. NB Power is working with the New Brunswick Department of Tourism, Heritage and Culture to install the stations. “It is a perfect fit to offer environmentally-friendly electric vehicle charging stations to provincial park visitors who are exploring the great outdoors of our beautiful province,” NB Power CEO Thomas Gaëtan said in a statement. New Brunswick, which has the third-smallest population among all provinces, saw just 53 new EVs registered in the province in 2017. But that’s up 124 per cent over the 24 registered the year before. “Installing charging stations at our provincial parks and attractions ensures our government is meeting the increase in demand for cleaner transportation methods for our tourists and residents, as well as supporting private and public sector efforts towards building a clean economy,” Environment and Local Government Minister Andrew Harvey said in a statement. New Brunswick is 72,908 square kilometres in size, bigger than only Prince Edward Island and Nova Scotia. But it is the first fully connected province with a fast charging network for EVs. 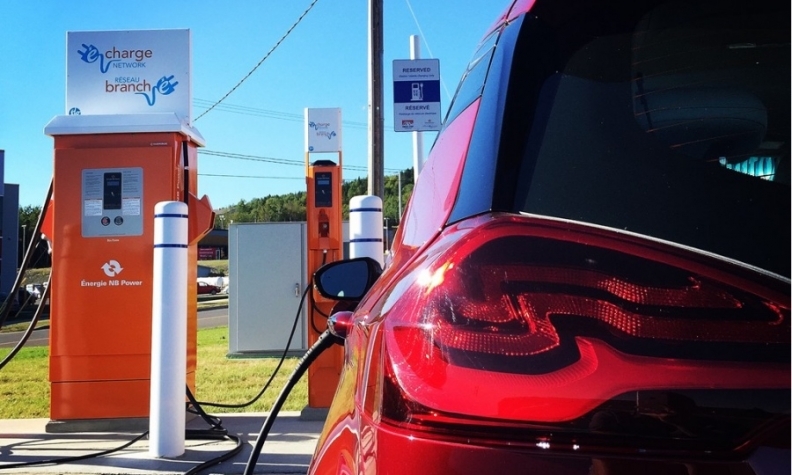 NB Power’s eCharge Network aims to enable drivers of EVs to travel around New Brunswick. Drivers may sign up to the eCharge Network online and download the eCharge Network app for iOS and Android to locate charging stations, add credits to their account and access charging stations. The eCharge Network is interoperable with the Electric Circuit in Quebec and the FLO network’s thousands of stations throughout Canada. There are currently 31 standard level-2 eCharge Network stations available for use in New Brunswick. It takes several hours to recharge completely at a standard level-2 charging station. The eCharge Network currently offers 18 fast-charging stations across a number of cities within the province.